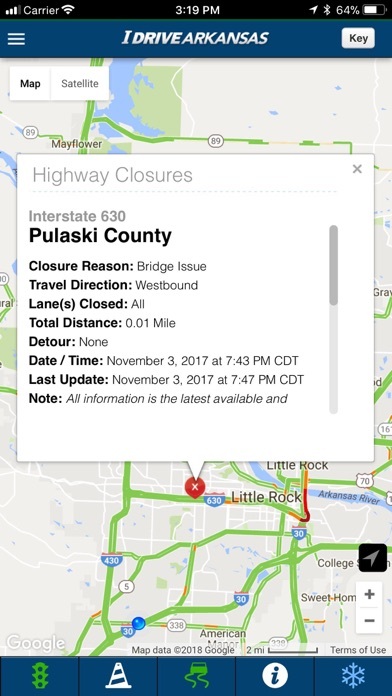 IDrive Arkansas is your source of traveler information for Arkansas Highways! 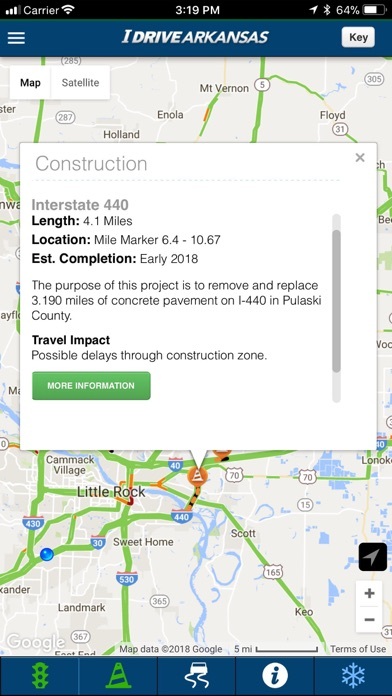 At a glance, IDrive Arkansas will show you the location of each construction zone on the state highway system. 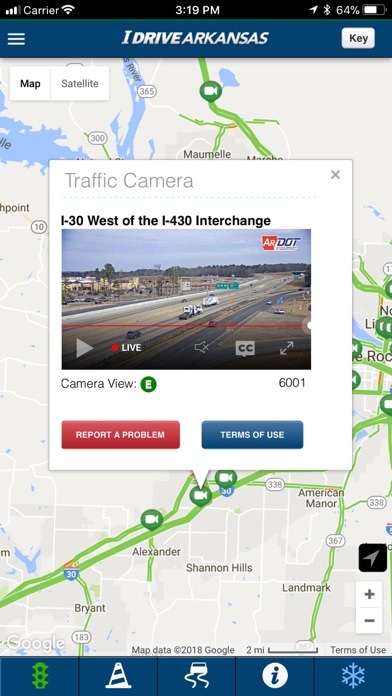 Activate the live traffic / traffic camera features for a clear understanding of how traffic is moving up to and through each construction zone. 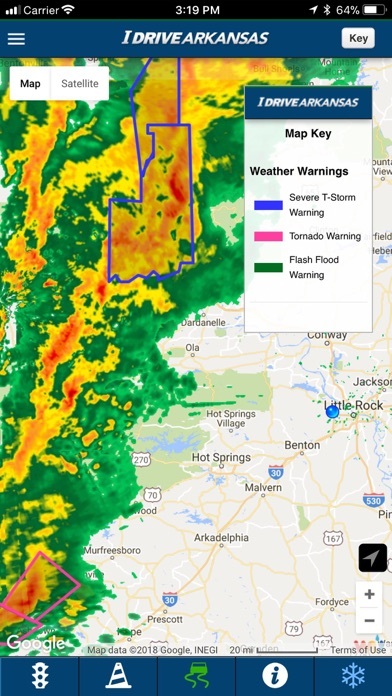 Add the weather radar feature and determine the impact storms are having on traffic moving through construction zones. The display features of IDrive Arkansas include: -	Live Traffic / Traffic Cameras -	Active Construction Zones -	Closed / Flooded Highways -	Alternate Routes -	Weather Radar / Warnings -	Winter Weather Road Conditions -	Arkansas Welcome Centers and Highway Rest Areas -	Commuter Park and Ride lots -	Weight Restricted Highways and Bridges All highway data is delivered in real-time and is provided straight from our crews in the field. 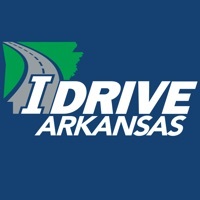 With IDrive Arkansas you can learn more about voter-approved construction programs, report littering, request a complimentary Highway Map of Arkansas, report problems on the state highway system, and submit questions. Good app but PLEASE PLEASE PLEASE can the app somehow include notifications or show on the map where trains are stopped at on the tracks so we can know if roads are blocked? The one in Mayflower happens all the time and there are no close shortcuts around and it’s 15 minutes extra (on top of 10 minutes waiting and giving up) to turn around. It would help so much if the app could show if there was a train stopped so I could wait to leave or take an alternate route from the start rather than the 30 minute delay it causes me. I’ll change to 5 stars if the IDrive can do this. Please! We are desperate- those of us who are affected by the train stops or breakdowns! Thank you!! Idrive Arkansas, your app keeps freezing every time after I open it, can you all please fix that issue. It's annoying, the google play Idrive Arkansas app does not freeze up on me. Can you fix the freezing issue asap. Recently reviewed as crashing all the time after a few minutes of use. Downloaded the updated version. Works great. Thanks. Great app when it works but the last few months it CRASHES ALL THE TIME... Please get your IT guy to fix it PLEASE before all the bad winter weather gets here... Thanks. App closes when you zoom in. Please fix. I’ve tried deleting app and reinstalling, still can’t get passed the opening screen. After many tries I did finally get a blank white screen. Only 5 cameras in NWA and they don't work most of the time. During years of construction of 49 I see cameras watching us every half mile, I bet they all worked just fine!! Nice to see that live HD traffic cams are coming online. I use this app frequently and never have problems. I always know when to take an alternate route to work. It saves me time and money. I wish all states had it. Every time I try to open the app, it tells me I'm not connected to the internet. The map messes up when I swipe on the screen to move to a different location. When I first open the app that's as far as it lets me scroll out. It doesn't swipe or keep on scrolling out like Google and Apple maps does. This app has some bugs and need some new features. Good information, easy to use, works as advertised. Much easier than trying to go to the website. Just uninstalled and reinstalled now works good. Ok this app does work you just have to give it time to update. After a few minutes you should be able to see what roads aren't clear. Just used this app while my husband was driving and it was accurate. 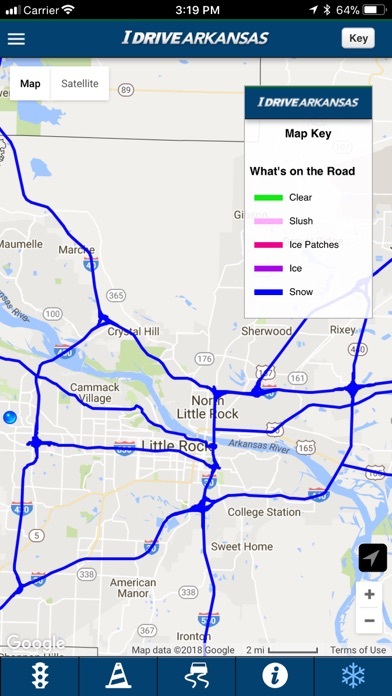 This app works as well as AHTD's ability to remove snow from bridges and roadways. Enough said. Not good if you live in Clark County. The roads are bad & it shows that the roads are clear. Get it right. Doesn't even deserve one star. Road conditions map will not load. Therefor no good. Come on AHTD! This is a useless app! Just go to website. Same info. Very out of date weather road conditions.